“How do you sleep during the Midnight Sun?” I asked GuideGunnar. 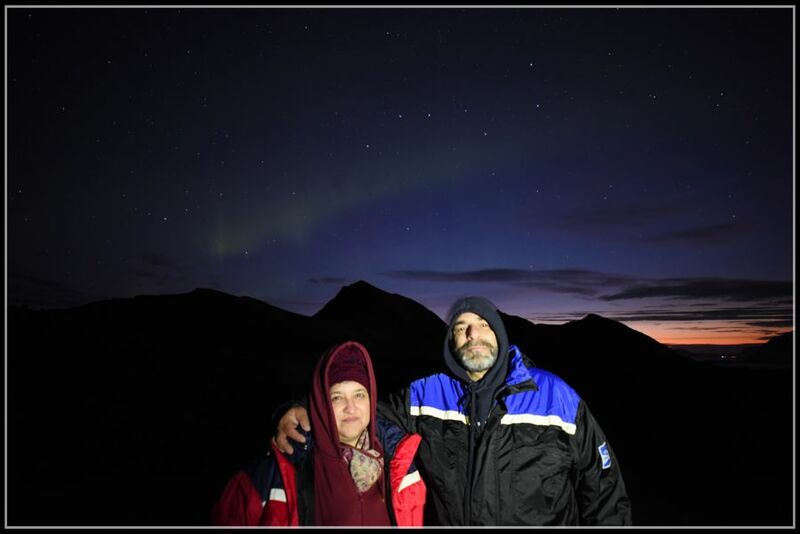 “I close my eyes,” he said, tongue-in-cheek, eliciting a laugh from us as we waited for the Northern Lights to appear at Rekvikeidet, a chilly, open plateau near Tromvik. Arun and I shivered in the icy winds, looking to the heavens for a glimpse of the elusive Lady Aurora until I decided to stop torturing myself and put on one of the thermo suits that GuideGunnar had offered us. Arun took one too, and we both felt much more comfortable. 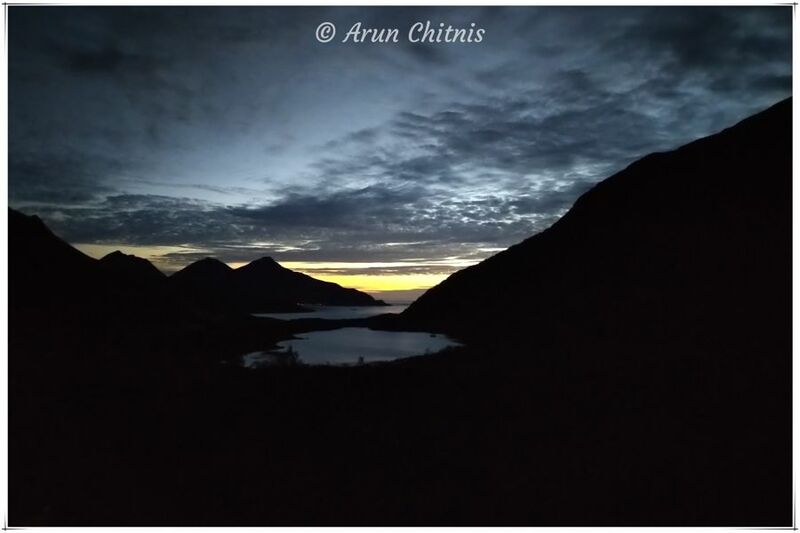 It was after 10 pm on the 5th of September 2018, and the long days and short nights of autumn meant we had to leave an hour later than usual on our Tromsø Aurora chase. The Northern Lights Tromsø tour left from Guides Central, which turned out to be just behind our Tromsø hotel, the Clarion Collection Hotel With. We were expected to report at 7.45 pm, so we left just a few minutes before that and climbed up the stairs of the two-storey building to where GuideGunnar was waiting. He welcomed us and told us that one other couple would be accompanying us, so there’d be just four of us tourists on his small Northern Lights group tour from Tromsø. The young Chinese couple who came in turned out to be from Hong Kong. They didn’t speak much, except to giggle and whisper to each other during the tour. 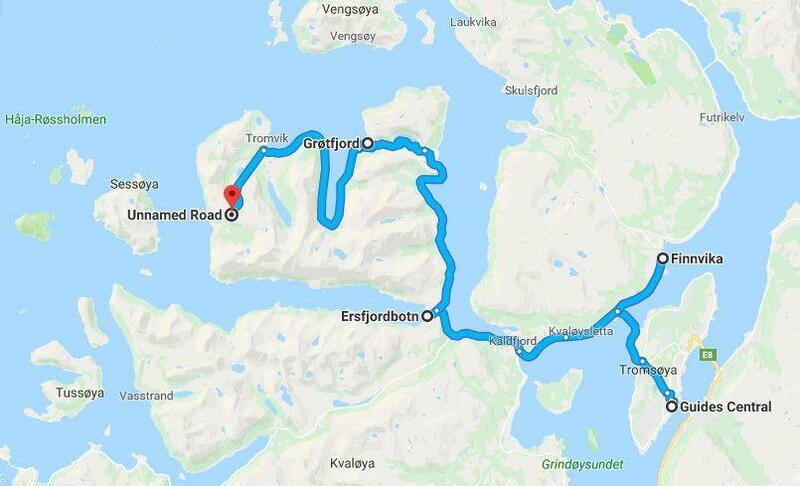 I was very curious to learn more, so I paid close attention when GuideGunnar told us what to expect on our Northern Lights Tromsø bus tour. He explained that depending on the weather and if the clouds came in, we may have to drive for hours, and even cross the border into Finland, if necessary. He also told us a bit about the history of Tromsø, which played a big role in World War II (more on that in another blog) and was generous in sharing his in-depth, local knowledge. We told him about our upcoming trip to Lyngen North, and he said he knew Ola, and that his grandfather would probably be able to tell us more about the war since the Germans had built the Spåkenes kystfort in the area. 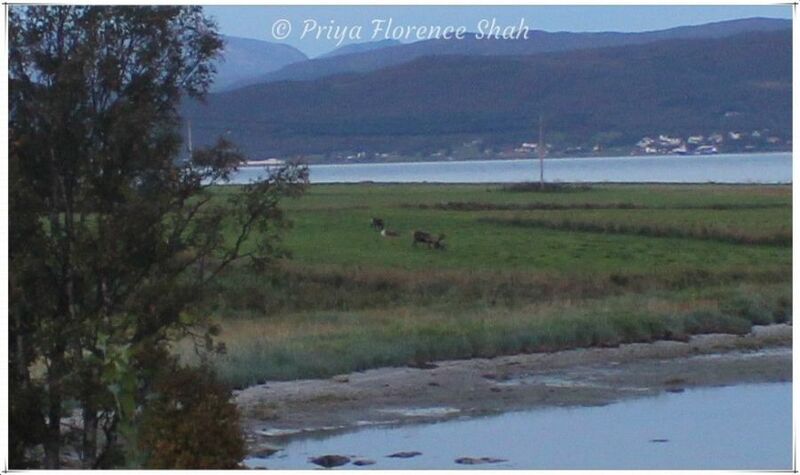 Because it was still early and quite bright, Gunnar took us first to a spot where some wild reindeer had been spotted, and we could see them grazing from afar. When I asked him which supermarket was the best place to pick up provisions, he recommended the Eide Handel in Eidkjosen, where you can get the best quality produce. He even took a detour to Eidkjosen so we could pick up some stuff. Since we didn’t want to be lugging big bags around on our Northern Lights chase from Tromsø, we didn’t pick up any provisions. Instead, Arun picked up some premium tobacco called Snus. Gunnar found this very funny, considering that the supermarket had some of the best produce available. Our next stop was a scenic spot called Henrikvika by Kaldfjord, where we stopped to take photos of the beautiful bay at twilight. After that, we made a stop at the fishing village of Ersfjordbotn, and enjoyed the sunset while Gunnar chatted with a fisherman. Next, we drove to the top of a hill at Grøtfjord, where we waited by the side of the road wearing the luminous, reflective wristbands that Gunnar had given us for night safety. We spent quite a while here, watching for the Aurora borealis and enjoying the fabulous view of the bay and the long sunset until Gunnar decided that it wasn’t happening and decided to take us to another location. This involved a drive on some roads that seemed a bit unfinished, to an open and windy plateau where we would have the best chance of spotting the lights. Here, GuideGunnar provided us with tripods, helped us set up the cameras and gave us an impromptu lesson in Northern Lights photography. He set the camera to manual, increased the exposure time and set the ISO to 800, telling us to change it as needed. Since I had no experience with night photography, his guidance proved invaluable as darkness fell and the first wispy threads of the Aurora made their appearance on the horizon. The Aurora borealis, when it is weak (GuideGunnar rated that night’s Aurora activity as 2/10) looks like translucent clouds with little to no colour to the naked eye. It’s only when photographed through the DSLR that the greens and purples appear. Once I got comfortable with adjusting the camera settings to capture more light, I got much better photos. GuideGunnar set up a campfire for us and served us a delicious snack called Skattøra Lefse – Arctic Norway’s traditional and locally made pastry with cream and sweet goat cheese. Since I’d taken a liking to the Norwegian brown cheese or Brunost, I enjoyed it thoroughly. He also served some hot blackcurrant jus, which was very welcome on that chilly night. As we sat around the campfire in our thermo suits, Arun and I lay back in the grass and watched satellites drift slowly across the sky. With no light pollution, we could see them clearly. It was a rare sight for city folks like us. Gunnar decided that we should wait till 1 am to see if the lights returned. Arun and I were still jet-lagged and exhausted by this time, and we had a Fjord sailing excursion planned the next morning, so we rested in the bus till it was time to go back. 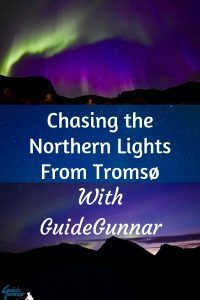 According to GuideGunnar’s Aurora blog, we covered 120 kilometres and spent 6.5 hours on our Northern Lights chase from Tromsø. 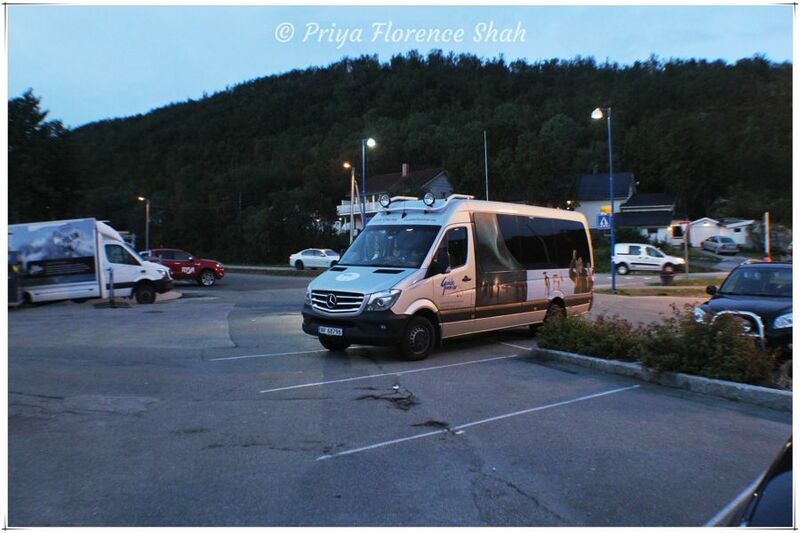 It was our first excursion in Norway and a very enjoyable one. GuideGunnar was the perfect tour guide and his photography tips served me well when we stayed at Lyngen North. He also happens to be a local TV star of the Chasing the Northern lights TV series. The best time to see the Northern Lights is from early September to early April. North of the Arctic Circle, the sun does not rise above the horizon during the middle of winter (from around mid-November to mid-January). 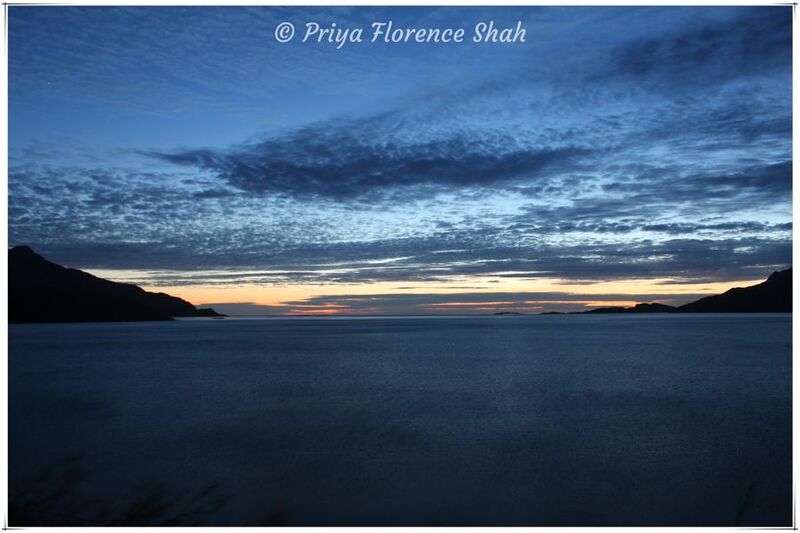 This is called the Polar Night. 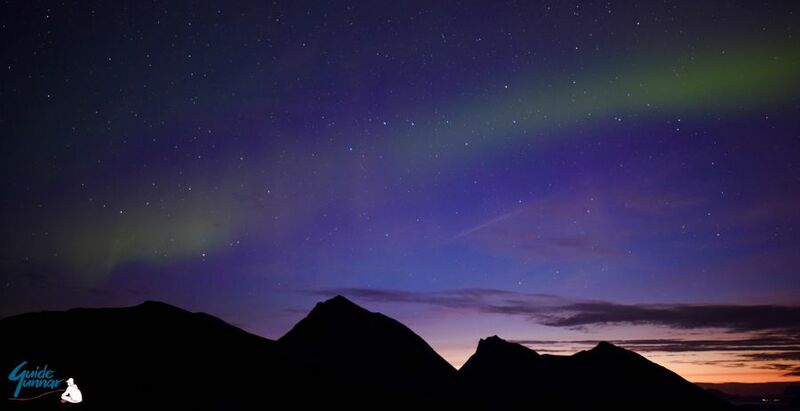 The Northern Lights are visible when darkness falls so you can see them from mid-August. The tour guides begin their Aurora chases from the beginning of September. 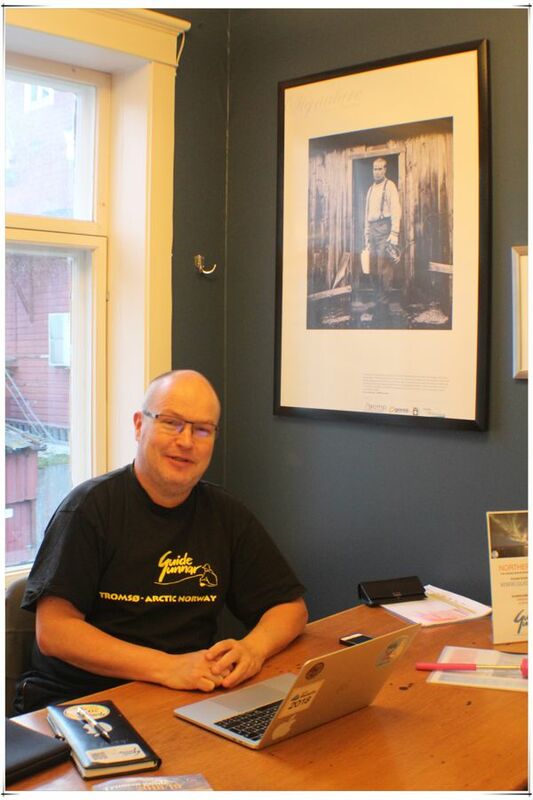 However, when I tried to book an Aurora chase for my dates (5th and 6th September), GuideGunnar was one of the few tour operators in Tromsø willing to take small groups on a tour before the 15th. That’s dedication! You can download the My Aurora Forecast app to see how likely you are to see the Aurora borealis and find out about solar wind activity (which is what causes the Northern Lights). However, no one can guarantee that you’ll see them. It takes a combination of good weather and solar wind activity to have a good chance of seeing them. Oh, and a good Aurora guide and a healthy dose of luck, too! The Northern Lights are most likely to shine often and strongest between 8 pm and 2 am, but it’s also possible to see them before and after this period. 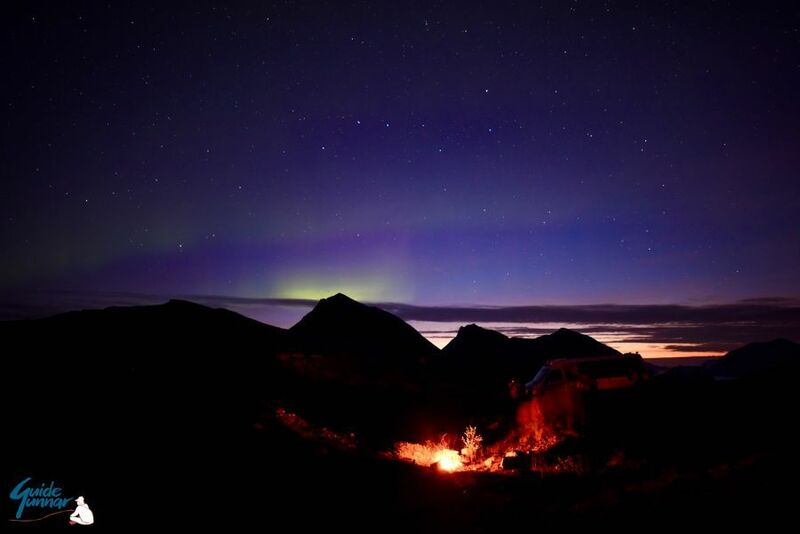 The nights can get pretty cold, even in early September, and when you’re chasing the Northern Lights outside Tromsø, the wind chill can get quite uncomfortable. Wear 2 to 3 layers of clothing when you go on a chase and if you’re freezing, don’t try to be brave and ride it out. Put on a thermo suit and stay warm, even if it looks a bit ridiculous. GuideGunnar will show you a movie or two about the Northern Lights while he’s driving you in his bus. Soak it all in, including the fascinating science behind them and the strange beliefs and superstitions that people had about the lights in days gone by. For Northern Lights photography, you’ll need a DSLR or mirrorless camera. A mobile phone won’t cut it, no matter how good it is, as you need long exposures (some of mine were 30 seconds long). Guide Gunnar will provide the tripod so you don’t need to carry one. Follow his guidance on taking Aurora photos as he’s an expert on it. 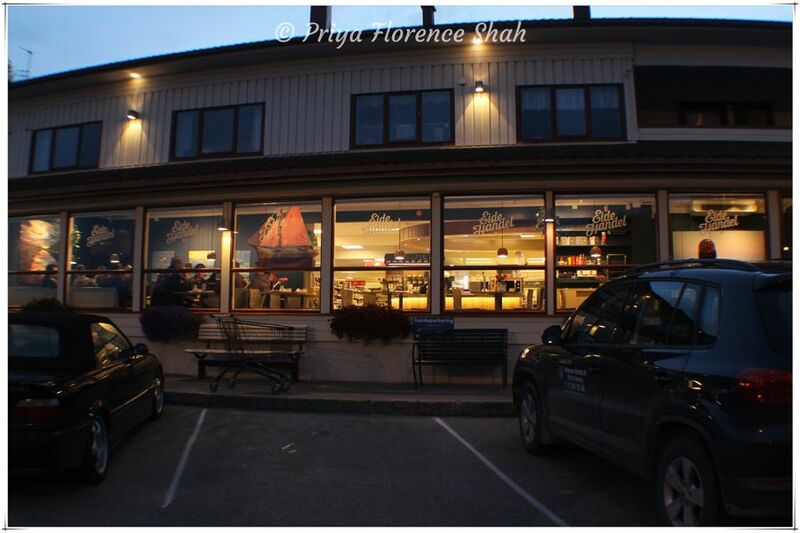 Read all about GuideGunnar’s Aurora Chase tours and watch his movie here. For a 5% discount on his tour, like his Facebook page and book directly on his Facebook app. However, for the best discount on GuideGunnar’s chases, you can book more than one chase, since you can’t be sure when you’ll see the Northern Lights. 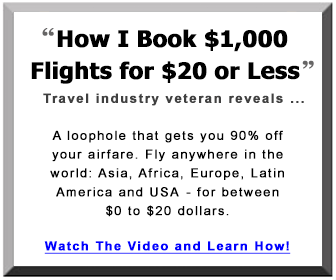 Here are the discounts he offers. Some of the photographs in this post were provided by GuideGunnar and are indicated as such. Watch the highlights from our Northern Lights guided tour from Tromsø (and some fabulous Aurora borealis photos from GuideGunnar) in the video below. I’ve been to some cold places in my lifetime, but nothing beat that freezing night on the plateau in Norway’s untamed wilderness. And, of course, our first sight of the Northern lights added another layer of goosebumps. Those thermal suits literally saved our butts and other critical body parts. It was so far out that the road actually turned to gravel in the end – something rare in such a highly development-conscious country. Gunnar’s insightful commentary kept the whole experience lively throughout. This was literally a ‘chase’ – the travel plan was open and would take us wherever we were likely to catch the Aurora borealis. I especially loved his photography tips. Would never have been able to photograph the Northern Lights or the Milky Way without them. We’re heading to Iceland next month and I cannot wait to see the Northern Lights. Has been on my bucket list for too long. You had some incredible sightings in Norway! Thanks, Jenny. I hope you get to see the Northern Lights in their full glory. We did a Northern Lights chase with Gunnar during our time in Tromso in 2012 and it was magical. We had been out the night before with another guide but too many clouds spoiled our chances of seeing them. Thankfully, the night we went with Gunnar we saw them for hours and I got quite a few good pictures. It was amazing to stand beneath them and watch. I was so impressed with Gunnar, and raved about him so much, that a work colleague went shortly after we returned and booked a night with him as well. When we return to Tromso in a few years time with our son we will definitely be booking our chases with him! So awesome to know that, Cath. I found him very professional and competent. He did everything he could to make our tour enjoyable. I am heading to Iceland this December and I believe I can see the northern lights there. The photos you have put in your blog are epic. If I ever visit Tromso, I would surely contact GuideGunnar. Thanks for the share. Good luck in Iceland, Shreya. I hope you see the lights and get some great photos of your trip. Thanks a lot for sharing such great tips in your post. I am for sure going to download the app you recommend and try to book a trip there. I hope you get to see them in the USA, Kristie. You don’t see too many people sharing that experience. So breathtaking and magical! Northern lights always bring spark to my wanderlust. You literally have to ‘chase’ those lights, eh? I don’t have much experience in night photography either so it would be great to have a guide tell me what to do and set up my camera for me! I’d probably travel in October, just to be more sure about the probability of seeing it and it’s really cool that you were such a small group of people, I think I’d prefer it that way. 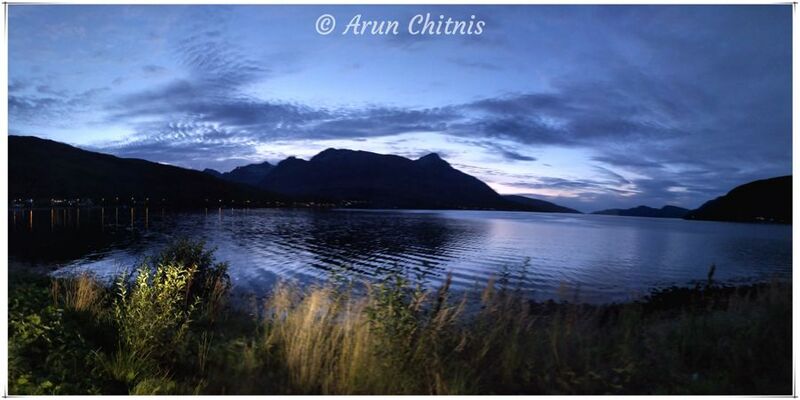 Lovely pics, considering it was your first attempt at night photography! 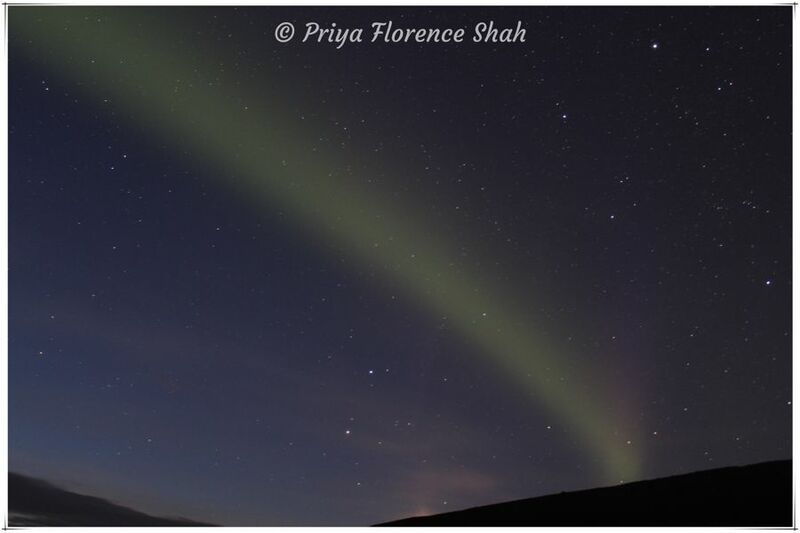 I’ve been to Iceland twice and to north part of Canada and I only manged to see the Aurora at about 2 as well. I have yet to find it at a super high number. The chase continues for me, but one day I will find them! Glad you got to see some of it at least. Tromso is probably the best place to see the Northern lights, along with Iceland. I was there only in summer, would like to come back in winter. You’re right, Alexander. It is one of the best places to see the Northern Lights. I am so very jealous! I have always wanted to see the Northern Lights and to go with a guide like you had with GuideGunnar sounds perfect. I personally tried on my own while in Iceland but apparently I attract lots of clouds. Thus I struck out. But perhaps I would have better luck chasing the Northern Lights outside of Tromso! I really recommend going to Lyngen North, Eric. Stay for at least 3 days and you’ll definitely spot the lights. It was an unforgettable experience for us. What an amazing experience! This is a dream of ours to do one day. The guide seemed to be very informative. I think your photos are amazing! 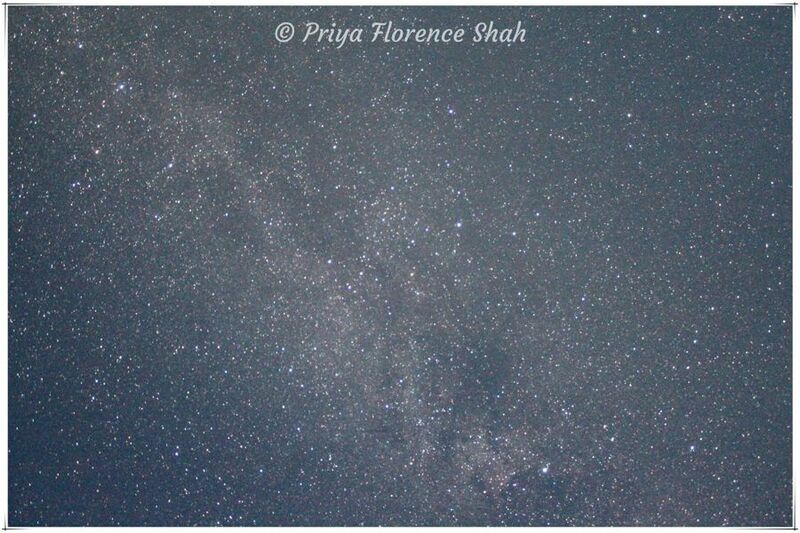 You captured so many stars in your Milky Way photo. Thanks, Christina. Still a beginner with the DSLR, but am learning. Hope you get to do it someday, too. I just came back from Iceland where I saw northern lights for the first time in my life and I’m hooked now! Seems like Tromsø is my next destination and I gotta say, your first attempt at photographing them is pretty amazing. Would for sure love to do a tour with them! I don’t think it gets that cold in Tromso, Bekah. It is warmer than most other places located on the same latitude, due to the warming effect of the Gulf Stream. Yes, I highly recommend getting a DSLR and learning how to use it. I’m a beginner with it, but GuideGunnar taught me how to take decent night photos. Ohh wow this is so breathtaking! Looks amazing! Thanks so much for sharing! The images are fab! Glad you like them, Snita. 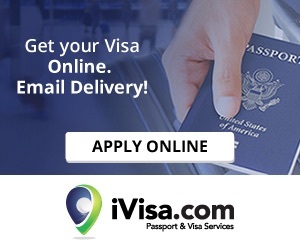 Your experience sounds so exciting and earthly, in the sense – you got to see some remote areas of Norway, the wild untamed beauty of the country and such a clear view of the Northern Lights. 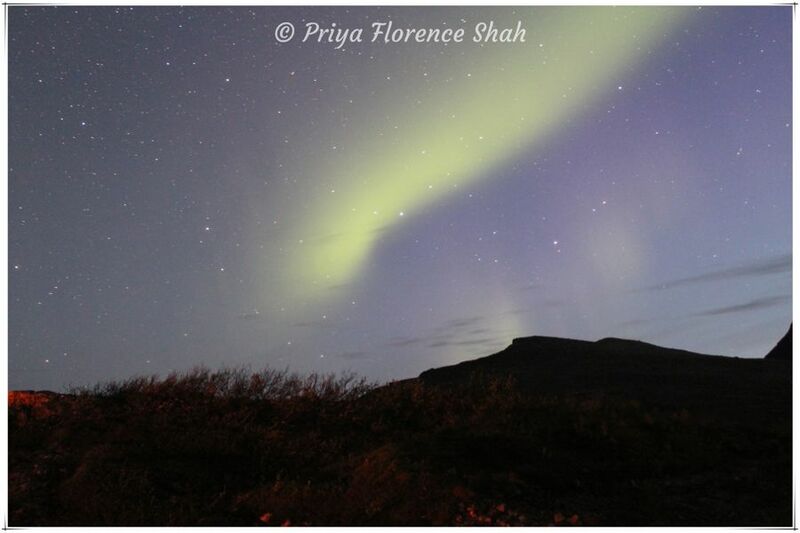 Now I am confused about which country to visit for Northern Lights – was planning to do Finland next year October. Need to do some replanning now! There’s so much more to see in Norway than just the Northern Lights, Vaisakhi. The fjords are amazing and Tromso was very charming too. 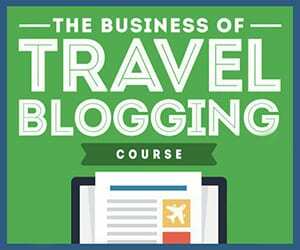 More blogs about that coming up soon. Seeing the Northern Lights is at the top of my bucket list. I am not the best photographer so I would want to book a tour like this where you get photography tips. It’s absolutely essential to have a good guide if you want to take decent photographs, Patti. Not everyone is skilled at night photography. Loving the thorough post on sharing the experience, looks like it would great to do this tour with Gunnar, he’s obviously really committed to helping his guests experience the aurora. I know a lot of tours their blurb just says that if it’s not visible in the area they always take you to, tough luck, whereas he’s obviously willing to go the extra mile, literally, to help you see it! Amazing!!! Not only did you experience the Northern Lights but you were able to capture the beauty. I’m sure you guys will never forget it. A guide that can help you take pictures and feeds you is golden and my type of guy. I think this is the way to see those lights. Yes, Alexander, you definitely need a good guide and GuideGunnar is the best. I always want to see the Aurora Lights – thanks for this post. Gave me a huge relief when is the best time to go, camera to use and the Guide. Glad to be of help, Kate. I wish you success on your Aurora chase. It must have been an amazing experience to watch the Aurora. The Northern Lights are something that I want to see, it is in my grand bucket list. But whenever I read the experiences of others, I feel that I have been transported to that place. You guide was really one of the best. it makes the experiences much worthwhile. Loved your post, photography and all the tips.